Need more information about booking Home 1730815 ? 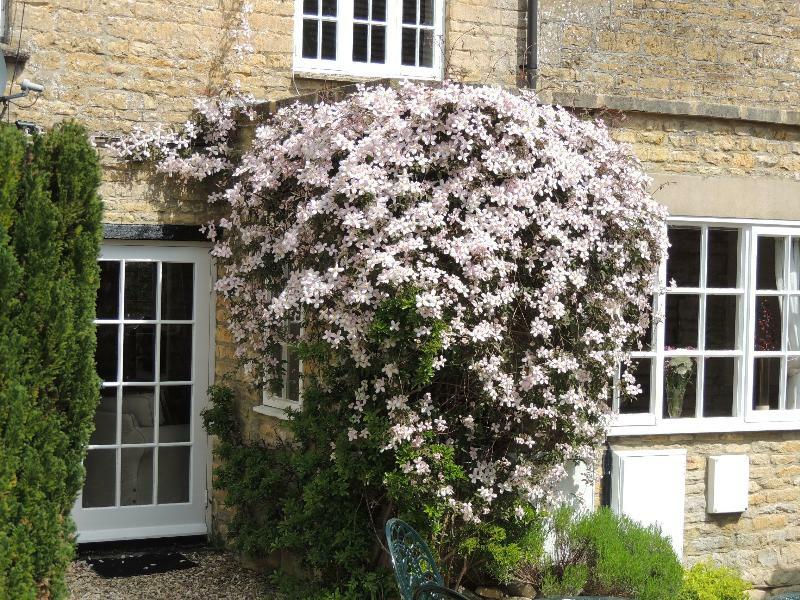 Lavender Cottage is a pretty Grade II listed three-storey cottage built from traditional Cotswold stone. It was originally built in the late 17th Century and has been lovingly restored, whilst retaining many original features.The cottage is situated in a quiet cul-de-sac of historic properties, complete with pretty village green, in the heart of Bourton On The Water, often referred to as "The Venice of The Cotswolds". The only thing that will disturb you is the sound of birdsong.You can see the River Windrush from the entrance to the cottage and it's within five minutes walk of all the village attractions and amenities, including Birdland, The Maze, Motor Museum.The village is a joy to explore, with all it's quaint shops, cafes, restaurants and pubs. Many countryside walks start from the village, including walks to traditional pubs. We can arrange a pick-up from a local railway station if you want to leave your car at home. GENERAL FACILITIES : Free unlimited wifi, central heating, on-demand hot water, garden.There is no charge for gas & electricity. As in most old cottages, the stairs are winding ( there are handholds ) and you may have to "duck" at the foot of the stairs if you're very tall. Not suitable for those with mobility problems. Welcome Pack includes wine, juice, milk, filtered water, butter, filter coffee, instant coffee, a selection of teas, jam, bread, cereals, fruit / snacks. KITCHEN & DINING AREA : Fully equipped, including large fridge/freezer, washer/dryer, iron & ironing board, gas hob & electric oven, microwave oven, toaster, kettle, cafetiere, dining table & four chairs. Stable door to garden.SITTING ROOM : The beamed room has two large comfortable 2-seater sofas, living flame fire in inglenook fireplace, 32" flat screen Freeview TV, DVD player, iPod dock, CD player. There is a selection of books, maps, DVDs, CDs, magazines and games. Glazed door to garden. SHOWER ROOM : The newly-fitted modern shower room on the first floor has a large shower cubicle, toilet, wash basin, mirror with light & shaver socket. Beautiful views towards the river.BEDROOMS : one king size + one twin. Both bedrooms have firm, Sealy posturepedic mattresses, hypo-allergenic duvets & pillows, mattress & pillow protectors, and a choice of medium or firm support pillows. All bedding, fluffy towels and huge bath sheets are provided.There is space to store luggage under the beds, and in the cupboards in the twin bedroom.The king size bedroom on the first floor has a 5ft bed, bedside units, wardrobe, chest of drawers, window seat. Views across the garden. You'll have to "duck" at the entrance if you're very tall.The twin bedroom on the second floor has two 3ft beds, wardrobe, cupboards with shelves, bedside unit. The room has several characterful old beams. Views to fields.The entrance to this bedroom (no door) has reduced headroom, so you'll need to "duck" as you go in. BABIES & TODDLERS : We have the following items available on request : large travel cot, with foam mattress & fitted sheets; high chair; baby bath; potty; changing mat. OUTSIDE : The garden comprises a stone patio, gravelled area and beds planted with flowers & shrubs. Ideal for enjoying an al fresco breakfast or a glass of wine after a walk across the surrounding countryside. It's a real sun trap. Parking is on the road and around the small village green outside. This Cottage has 2 bedrooms, 1 bathroom and sleeps 4. It’s been listed on Holiday Lettings since 24 Apr 2014. Located in Bourton-on-the-Water, it has 184 reviews with an overall rating of 5. The average weekly rate varies from £760 to £1000. We have had a lovely week at Lavender Cottage. It is well located, close to the river, shops, pubs/restaurants. The cottage has everything you could need - really well stocked and comfortable. Owner's reply: I'm pleased that you all enjoyed your time at Lavender Cottage. It's a perfect location, being so close to all that the village has to offer yet being tucked away from the hustle & bustle. Thanks for taking the time to share your experience. Great cottage right in the middle of Bourton on the Water. Easy access to the village but still private and quiet. Owner couldn’t be more helpful, lots of useful info , lovely welcome pack. Even an offer from the owner to babysit if required. Really couldn’t do more. Cottage was beautiful and fully equipped with all you would need. Clean and beautifully presented. Would definitely recommend it. Went with my elderly mum and sisters and had a fabulous weekend. Owner's reply: Thanks for taking the time to write this lovely review of your stay at Lavender Cottage. I'm so pleased that you enjoyed your family gathering here and that you appreciated all that the cottage & the village have to offer our guests. We stayed in lavender Cottage for Easter weekend and had a lovely time. You could not got more central than lavender Cottage. Right in the heart of the village. But not a bit of noise or disturbance. The layout of the cottage was perfect for me, my husband and our 5 year old. The property had everything you need in it. We couldn't have wanted more. The husband and I have a new found love/competitiveness for Scrabble!! I Did want to steal the whole bed including the duvet and pillows. Soo comfy!! The extra touches left by Hilary were excellent. Including gifts for our little one, Easter eggs and a fridge and cupboard full of food. Communication was excellent. We had an absolutely amazing time (despite the British weather). Bourton is beautifu with so much to do, either on your doorstep or a short drive to one of the other gorgeous Cotswolds villages and lavender Cottage made our trip!! We will without a doubt return!! Owner's reply: Thanks for taking the time to share your experience of Lavender Cottage and the village. I'm pleased that you embraced the typical Bank Holiday weather and that it didn't spoil your stay here. I'm glad you appreciated the amenities and trust that you'll continue with the Scrabble competitions at home. We look forward to welcoming you again in the future. Owner's reply: I know how much you all enjoyed your stay here, so thanks for sharing your experience with this lovely review. It's always good to hear that our guests appreciate the level of service we're offering. Lavender Cottage will look forward to welcoming you again. We visited Bourton on the water on Dec 4th and we stayed at Lavender Cottage. This cottage was one of the prettiest, clean, well equiped and just idyllic. The arrangements were well thought of and attension to detail paid by Hilary and Alisdair, for the little things, made our stay even more enjoyable. Bourton on the water is a must visit and very aptly called the Venice of Cotswolds. Simply loved the place and surely be visiting again!! Owner's reply: Thanks for taking the time to share your experience of Lavender Cottage and Bourton-on-the-Water. I know how much you enjoyed your stay here & we'll look forward to welcoming you again. Lovely ,cosy cottage very well equipped.walking distance to shops tea rooms etc. Woul highly recommend. Owner's reply: Thanks for posting this review. I know how much you all enjoyed your stay at Lavender Cottage and look forward to welcoming you again in the future. Lovely cosy cottage in a great location right by the river/centre. Very comfortable beds and lots of extra little touches , welcome pack of groceries including a bottle of wine and a thoughtful card and chocolates for my mum's birthday. A bit tricky for parking but did manage to find a spot each day after we had been out for the day. The stairs are quite steep and tight without a banister so my 84 yr old dad couldn't make it to the top floor but that is to be expected in a cottage of this age and it is mentioned in the details so not a complaint, just a comment ...old people or small children may find it tricky. Thoroughly enjoyable stay ,lots to do in the area and Bourton has lots of nice restaurants,pubs ,shops a great chip shop and good bakeries. I would like to come back with my husband to do some of the walks around. Owner's reply: Thanks for sharing your experience and raising a couple of valid points. I appreciate that the issue with the stairs was a comment, not a complaint. For other people reading this, we do make it clear, both in our listing & via personal email, that the cottage is not suitable for those with mobility problems. There are hand holds on the stairs, but it's not possible to install banisters. I'm sorry that your father had difficulty. This part of the village was built long before people had cars, so it's good to hear that you found a parking spot every day. Our guests have never had a problem parking close to the cottage, but it can get busy during peak holiday time. There are some lovely walks starting in the village, so maybe we'll see you & your husband in the future. We had a lovely three-night stay in Lavender Cottage. The accommodation was ideal and in a super location. The owners, Hilary and Alistair, were very thoughtful and generous. All in all, it was just what we'd hoped for – would definitely go back! Owner's reply: Thanks for sharing your experience of Lavender Cottage. I'm pleased that you finally got the relaxing break you were looking for. We had the pleasure of staying at Lavendar cottage for 3 nights. The communication from Hilary prior to our arrival was great, all the information was very clear and she also let us check in early which was much appreciated especially when traveling with two small children. Upon arrival the cottage was neat and tidy and so lovely. There was so much supplies for us in the fridge and also two little books as presents for our children! We thoroughly enjoyed our stay at Lavender cottage, a perfect little spot for exploring the Cotswolds! Owner's reply: I'm pleased that you enjoyed your trip to the Cotswolds and that Lavender Cottage provided the perfect place to stay. Thanks for taking the time to post this review. Owner's reply: Thank you. I'm happy to hear that you enjoyed your return to Lavender Cottage and that you appreciate the experience we offer our guests. You'll need to send Hilary (the owner) an enquiry to book - the owner will let you know how to pay. If they accept online booking they'll send you a quote and info on how to pay. If you pay through our website you’ll be covered by Payment Protection. Or you can send Hilary (the owner) an enquiry through the contact form to request a quote. Hilary (the owner) will email you the total cost for your dates and how to pay. Send Hilary (the owner) an enquiry through the contact form requesting a quote for your holiday dates. Hilary (the owner) will email you the total cost for your dates and how to pay. Hilary (the owner) of this property is responsible for taking and refunding your damage deposit. The damage deposit terms should be agreed before booking and outlined in the booking contract, if Hilary (the owner) supplies one. Please refer to these details or contact Hilary (the owner) directly if you have any questions. You'll need to contact Hilary (the owner) to cancel. They should have provided their contact details when you made your booking - otherwise, email them through the contact form. You'll need to contact Hilary (the owner) to edit your booking. They should have provided their contact details when you made your booking - otherwise, email them through the contact form.